Chicken Shiitake Arugula Pasta. Last week, I was shopping at a brand new H Mart Asian grocery store that just opened closer to my home than the other H Mart branches in my area. H Mart has wonderful produce and is known for its selection of high quality fresh fish and live seafood. Very fresh greens, lots of varieties of fancy fresh mushrooms, and tons of spices are popular with loyal customers. 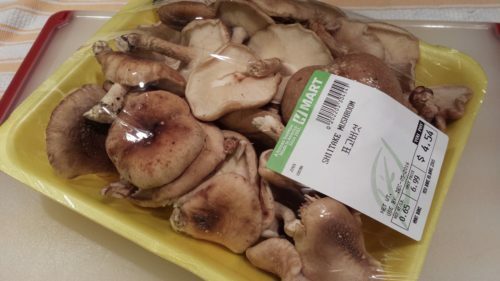 On the day that I visited, I bought a large package of shiitake mushrooms for less than five dollars. So what to DO with all those shiitake mushrooms? 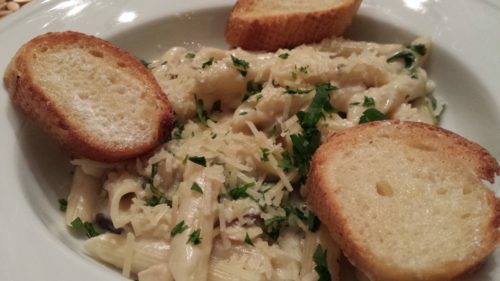 PASTA, of course! One of my favorite greens is fresh baby arugula. Not too long ago when it became extremely popular in salads, I just didn’t like the bitter taste of arugula. Now, I grow it in my garden and am also purchasing local organic arugula at various grocery stores. I’m always trying to find a great way to use “almost spent” arugula instead of throwing it out. Two of my favorite ways to use arugula that’s almost past its prime are in a Basil Arugula Pesto and as a side dish of Garlicky Creamed Spinach and Arugula. 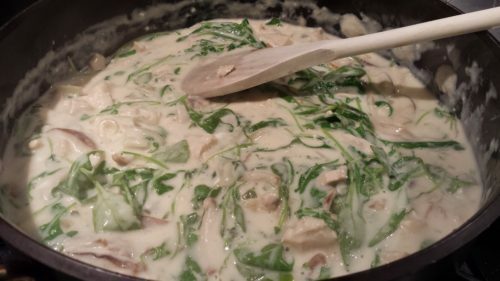 More often these days, I’m substituting plain Greek yogurt for heavy cream in creamy sauces. Usually the thick yogurt does a great job as a cream substitute and doesn’t make the sauce too watery. Try it yourself and see what you think. This rich-tasting recipe uses leftover rotisserie chicken, sauteed shiitake mushrooms, baby arugula, shallots, garlic, chicken stock, white wine, parsley, and, surprisingly, plain Greek yogurt to make a creamy sauce. 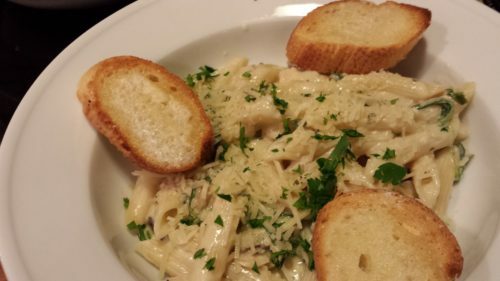 Just stir in your favorite hot cooked pasta and this dish is ready to serve. 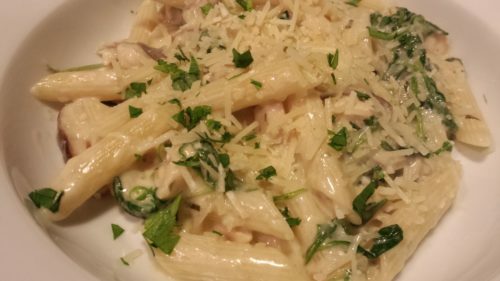 I’m using penne in this recipe yet you can use whatever pasta that you like. Sprinkle on some shredded Parmesan and chopped parsley before serving. 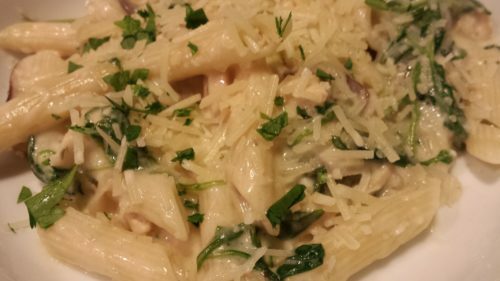 Add a few slices of garlic toast and a side salad to my Chicken Shiitake Arugula Pasta and you’ve got a quick weeknight meal. 1. Start out by cooking the penne pasta in a large pot of boiling water while the sauce is being prepared. When the pasta is cooked, drain and keep it warm. 2. Using a bit of olive oil in a saute pan over medium-low heat, saute shallots, garlic and mushrooms and then add the chopped cooked chicken. 3. Add some chicken stock and a splash of white wine, stir, and cook a bit to let the alcohol burn off. 4. Add some chopped fresh parsley. Let the sauce reduce somewhat for a richer flavor. 5. Next, stir in about 3/4 cup of plain Greek yogurt and then let the sauce thicken. If the sauce doesn’t thicken after a few minutes, put a small amount of yogurt in a small bowl and add a splash of cornstarch. Mix the yogurt and cornstarch together and stir into the sauce. If the sauce has thickened, you can add the remaining 1/4 cup of yogurt if you didn’t need to use it with the cornstarch. 6. When the sauce has thickened nicely, add coarsely chopped arugula and let the arugula wilt. 7. Add the shredded Parmesan and the cooked penne pasta to the sauce, stirring well to coat the penne pasta and melt the Parmesan. 8. Warm through and then season with salt and pepper. 9. Plate and serve with a sprinkling of shredded Parmesan and some more chopped parsley. Serves 4 as a main course and 8 as a pasta course. 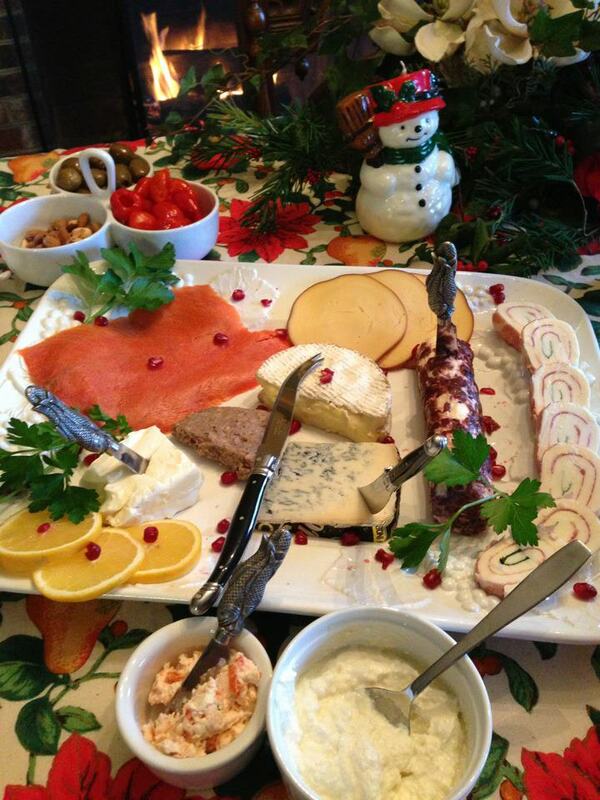 Offer with crusty baguette and butter or garlic toast. My Chicken Shiitake Arugula Pasta goes well with my Roasted Beet Salad with Goat Cheese and Pine Nuts. 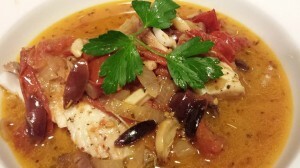 Serve with a dry white or light red wine. 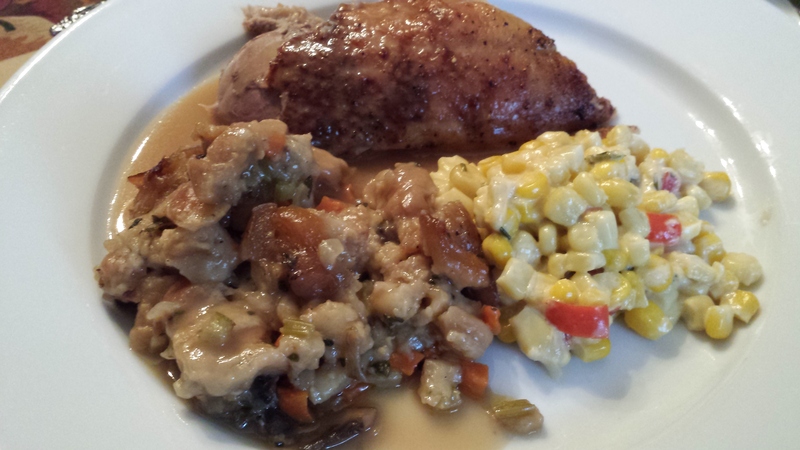 Variations: Use leftover turkey meat instead of chicken. Use cremini mushrooms instead of shiitake. Use fresh spinach instead of arugula. Use heavy cream instead of the Greek yogurt. Use your favorite pasta if you don’t have penne. For a vegetarian version, omit the chicken and substitute vegetable stock for the chicken stock. You could use dried shiitake mushrooms if you can’t find fresh. Just hydrate the dried shiitakes in water before using.